Imagine a bar soap made with natural glycerin and without any synthetic colors. We have created a 4oz (113 g) bar soap which contains all the natural ingredients that your skin is missing. All of our soaps packaging is wrapped in wax paper and it take 75 days for the bars to cure. 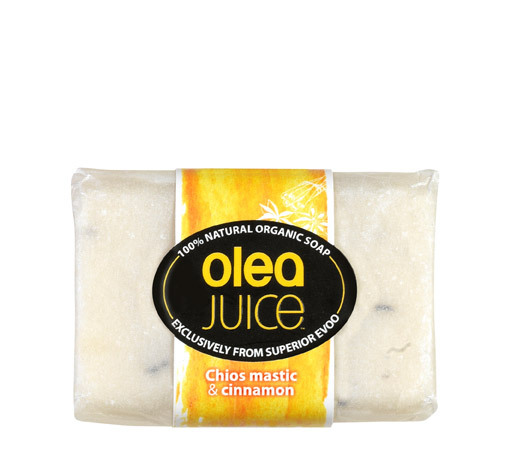 If you wish to spoil yourself, try one of our Olea Juice™ 100% “Artisanal” Natural Organic bar soap that fits you best. This Olea Juice™ Chios Mastic & Cinnamon contains our unique high quality of Extra Virgin Olive Oil that treats all your body with exceptional caring. Once you wash your body with this bar soap, the rare mastic resin that originates only from the Greek island of Chios together with the cinnamon’s spice create an irresistible bath experience. Saponified vegetal fats, (palm oil and palm kernel oil), water, Olea Juice™ Extra Virgin Olive Oil, fragrance, sea salt, glycerin, Chios mastic and cinnamon.